A single-track meeting creates more interaction opportunities that may lead to future advances. Prior to 2016, there were more meetings on multiple sclerosis (MS) outside of North America than within. For the last three years, however, The Americas Committee on Treatment and Research in MS (ACTRIMS) has hosted a meeting in North America (Video 1). Each of these has been dedicated to a single overarching scientific theme. In addition, and differently from most medical conferences held today, there are no parallel sessions at ACTRIMS meetings. This single track organization allows all participants—clinicians, basic science researchers, and everyone in between—to sit together in the presentation, interacting with one another and the presenters in response. Often, the questions raised at the end of a presentation were as important as the presentation itself. Frequently, presenters wrote down ideas raised by audience members. It would not be surprising to find out that a new discovery or pathway in MS was borne out of a question raised at one of these conferences. This column is a synopsis of the 2018 ACTRIMS meeting; the author interviewed presenters, and videos of those interviews are available online at msworld.org, and cited as links within this column. The theme of the 2018 meeting was therapeutic targets in MS. In addition, there were premeeting symposia from consortia of researchers, the North American Imaging in MS (NAIMS) and the International MS Visual System (IMSVISUAL) that complemented this theme. As both the hardware and software for image acquisition and analysis improve, it is possible to image lesions that were not visible with previous technology and to image MS lesions with greater detail. Presenter Dr. Cornelia Laule (University of British Columbia) discussed myelin imaging (Video 2), while Dr. Francesca Bagnato (Vanderbilt University) focused on axonal imaging (Video 3). 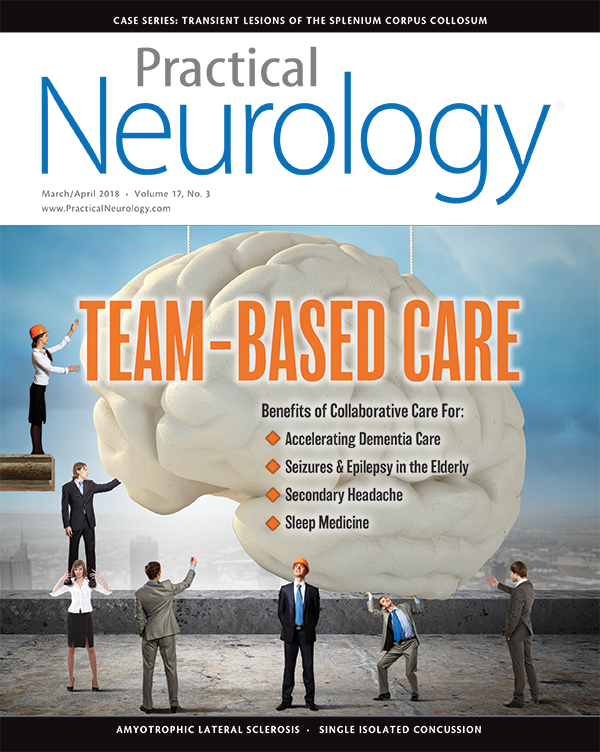 Both suggested that imaging advances may allow MRI differentiation of myelin versus axonal degeneration and that this may identify the stage of disease progression and provide targets for treatment in the future. Presenters Dr. Martina Absinta (National Institute of Neurological Disorders and Stroke) and Dr. Ulrike Kaunzner (Cornell University) both explored the paramagnetic rim seen on 7T (magnetic strength of 7 Tesla) MRI. Some researchers believe that this rim contains iron-laden macrophages and is a marker of early failure to repair lesions or irreversible tissue loss.1 Presentations were also given on positron emission tomo-graphy (PET) and high-field MRIs; however, as it is unlikely that either of these will enter routine clinical practice in the near future, the lesson for clinicians was more about reminding us that current imaging technologies are insufficient for completely characterizing MS activity in patients. We need to develop more robust clinical measures to measure how patients are doing in addition to advancing imaging technologies. The visual system plays an important role in MS research, not just because optic neuritis is a classic symptom of MS, but also because it serves as a microcosm of the CNS and can be imaged with optical coherence tomography (OCT) (Video 4). Dr. Ben Greenberg (University of Texas Southwestern) raised the issue of how past lumping of diagnoses, such as considering neuromyelitis optica (NMO) as a demyelinating disease, has actually harmed the field, because the primary mechanism in NMO is not demyelination but rather one of complement attacking the nerves. He also highlighted how dystrophin is important in NMO because dystrophin is expressed in neurons and glia and is required for astrocyte migration in the retina. Figure. The blood-brain barrier can be compared to the inner and outer walls of a medieval castle as shown here. Prof. Britta Engelhardt (University of Bern) started the session by showing fascinating videos of T lymphocytes crawling against the direction of blood flow to enter the CNS through tight junctions or through the endothelial cells. 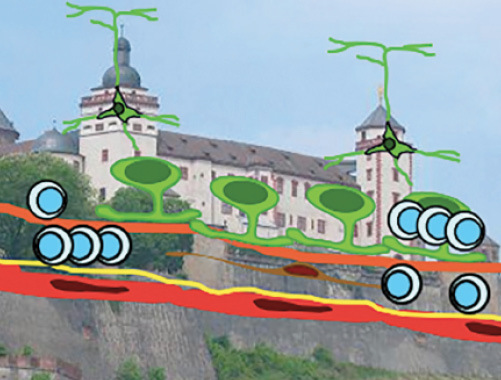 The blood-brain barrier was compared to the outer and inner barrier walls around a medieval castle, explaining how the unique two-layer barrier allows immunoprivilege in the brain but not around the vessels (Figure). Dr. Olaf Stuve (University of Texas Southwestern) tied the effects of MS disease-modifying therapies on the blood-brain barrier to the different mechanisms of action for each drug. Dr. Anne Cross (Washington University) pointed out that despite B cell depletion, oligoclonal bands remain positive in cerebrospinal fluid (Video 5), a reminder that as we use more B-cell depleting medications, spinal fluid results shouldn’t change significantly. Dr. Jennifer Gommerman (University of Toronto) highlighted the complexity of B-cell involvement in MS, and that the experimental drug atacicept, for which experimental trials were discontinued after an unexpected increase in inflammatory activity, may have been harmful because it affects plasma cells, which other medications, such as rituximab or ocrelizumab do not. Dr. Amit Bar-Or (University of Pennsylvania) tackled hemato-poietic stem cell transplantation in MS, which shows promise but has many questions remaining, including how to deliver stem cells, ablative vs subablative protocols, and how the immune system is reset posttreatment. Prof. Alasdair Coles (Cambridge) explained that the humoral autoimmunity seen as a side effect to alemtuzumab is not from the mismatch between T cells and B cells, but rather a combination of lymphopenia and defective thymic function leading to preferential expansion of autoreactive T cells from a limited clonal repertoire. Dr. Katerina Akassoglou (UCSF) spoke about the dual role of microglia in MS, where microglia are both pathogenic, destroying myelin and axons, and beneficial, allowing remyelination by clearing myelin debris through phagocytosis. Dr. Caterina Mainero (Harvard University) discussed using PET to image microglia in MS. Prof. Veronique Miron (University of Edinburgh) summarized how efficient remyelination requires proinflammatory death of microglia followed by repopulation to proregenerative functional phenotypes (Video 6). While splitting the sessions into various parts of the nervous and immune systems was helpful to update attendees on advancements in our understanding of MS, Dr. Michael Sofroniew (UCLA) raised an important question when he asked why there was a discussion on the blood-brain barrier separate from the one on astrocytes (Video 7) because astrocytes are an essential component of the blood-brain barrier. Like other cells of the nervous and immune systems, astrocytes can be both adaptive and maladaptive in MS. Dr. Francisco Quintana (Harvard University) hypothesized how FTY720 (fingolimod) may mitigate proinflammatory activities in astrocytes (Video 8). Dr. Wendy Macklin (University of Colorado) reviewed oligodendrocyte differentiation and myelination by introducing a new way to image single myelin internodes, while Dr. Paul Tesar (Case Western Reserve University) discussed strategies to identify remyelinating agents using in vitro oligodendrocyte progenitor cells. Dr. Ari Green (UCSF) demonstrated clemastine’s ability to remyelinate in MS models and humans where improved conduction and ability to see more letters on acuity eye charts is seen. Dr. Michael Hotchkin (Clene Nanomedicine, Inc.) reinvigorated interest in the previously retired treatment with gold by showing that nanocrystalline gold improves myelination across multiple in vivo models. Based on that finding, a phase 2 trial of gold for treating chronic optic neuropathy in relapsing-remitting MS will be starting this year. Dr. Leslie Kirby (Johns Hopkins University) explored how oligondendrocyte progenitor cells can mediate cytotoxicity through interferon gamma (Video 9). Young investigators presented cutting-edge basic science research that helps inform our understanding of MS. Researchers discussed receptors and targets in the most commonly used animal model of MS, experimental autoimmune encephalomyelitis (EAE) in rodents. Dr. Kirsten Evonuk (Cleveland Clinic Foundation) discussed that deletion of the AMPA (α-amino-3-hydroxy-5-methyl-4-isoxazolepropionic acid) glutamate receptor on oligondendrocytes prevented demyelination and axonal loss in EAE mice. Several presentations suggested there may be regional differences in immune cells or astrocytes involved in different areas of the central nervous system (CNS) in MS. Dr. Adil Harroud (McGill University) showed that body mass index, a risk factor for MS, may drive the association between young age at puberty and higher risk of MS. Dr. Naresha Saligrama (Stanford University) reminded us that, unlike other autoimmune diseases (eg, celiac disease), we have yet to find the antigen(s) that precipitate the autoimmune response in MS (Video 10). The fact that the organizers of ACTRIMS Forum 2018 felt the need to split the nervous and immune systems into various parts, highlights the need for artificial intelligence to reharmonize the ballooning body of scientific knowledge about MS pathogenesis and potential avenues of treatment. In the meantime, clinicians can use a deeper understanding of the basic science of MS to gain better insight into how MS disease-modifying therapies may benefit our patients. 1. Absinta M, Sati P, Schindler M, et al. Persistent 7-tesla phase rim predicts poor outcome in new multiple sclerosis patient lesions. J Clin Invest. 2016;126(7):2597–2609.